Sacred works of Heinrich Finck, madrigals of Philippe Verdelot, and settings of the Roman poet Virgil. I. Imago: Virgilio nella Musica del Rinascimento (De Labyrintho/Walter Testolin). Stradivarius CD STR 37065. "Imago", one of the last words spoken by Dido as she approaches death after having been abandoned by Aeneas, becomes the emblem of this overview on Virgil's musical fortune during the Renaissance. To the humanists, Publius Vergilius Maro was a model to aim for, by virtue of his garland of subjects and perfection of style. The search for manuscripts of his works in documented to have been ongoing since the late fourteenth century. In Mantua, amongst his collections, Francesco Gonzaga had Vergilian codices and a copy of the Aeneid in vernacular - Isabella d'Este Gonzaga, born and educated in Ferrara, once become Marquise, began to cultivate reading Virgil and planned to honor the poet with a monument, designed by Andrea Mantegna. At the courts of the Padan Plain, Virgil's verses became moreover creative material for musicians, who, with increasing frequency, set them to music according to the forms and styles of the moment. To gather them, means also to draw a line which, from Josquin Desprez to Orlando di Lasso, traces Virgil's fortune amidst the flow of compositional research of those years. Although the use of the Latin text in fact characterizes the form of the motet, usually elevated and abstract, it will not escape notice that especially the passages from Aeneid inspire compositional solutions similar to those experimented in the tumultuous world of the madrigal in Italian. Wanting thus to give a hint of this very turmoil, vocal arrangements were chosen which enhance the narrative texts, and some passages were entrusted solely to the instruments - practice much in vogue at the time. The selection, which is only part of the existing repertoire, follows a narrative thread - the bucolic exordium, the epic and encomiastic occasions, the telling of Dido, the inspiration given by Virgil. II. 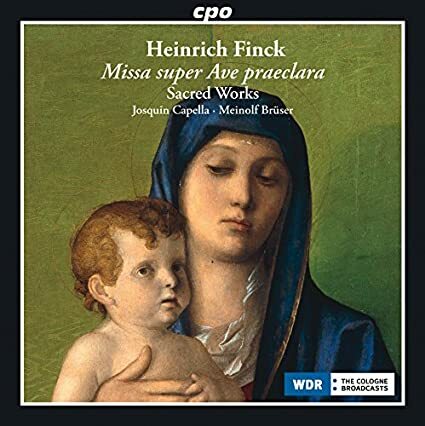 Heinrich Finck: Missa super Ave praeclara (Josquin Capella/Meinolf Brüser). CPO CD 555 066-2. Heinrich Finck was born in Bamberg and quite probably spent his formative years at the court chapel in Cracow or Warsaw in Poland. In any case, this is what can be gathered from comments by his grandnephew, Hermannn Finck, in his Practica Musica of 1556. Here we also read that his granduncle was famed as a master already in the 1480's. After a short period of study in Leipzig he then was active as the church music director at the Polish court in Cracow for a number of years. He interrupted his activity there in 1490 in order to accept a position at the Hungarian royal court, but this arrangement was not permanent. When the ducal ensemble was disbanded in 1514, Finck probably became a member of the imperial court chapel. He later served the Salzburg Cathedral chapter, then at the Scottish Abbey in Vienna, where he contributed to the development of the choral and instrumental ensemble, and finally as the chapel master of Emperor Ferdinand I's court ensemble. III. 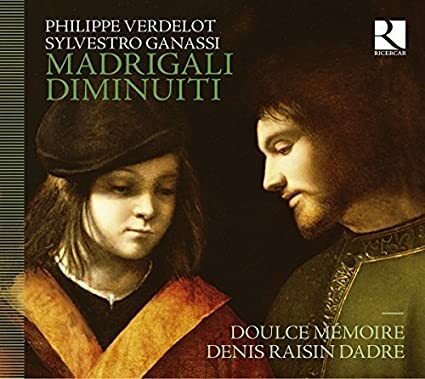 Madrigali Diminuiti (Doulce Mémoire/Denis Raisin-Dadre). Ricercar CD RIC 371. In 1535 Sylvestro Ganassi published in Venice the first treatise developing the technique of the art of ornamentation at an unprecedented level of rhythmic complexity and virtuosity. Playing the recorder, the instrument to which Ganassi devoted his work, Denis Raisin Dadre applies the rules of the treatise to the repertoire that Ganassi practiced, frottole and, above all, the madrigals of Philippe Verdelot. With the ornaments, the music proves to be a living art that practices a constant rhythmic shift, the exuberant virtuosity of improvisations and a 'swing' that would be typical of jazz in the 20th century.